Records on Findmypast cover the length and breadth of the English-speaking world and beyond, with the royal family appearing in various collections. The 1939 Register, a national census substitute taken on 29th September 1939, is just one example. First of all, let's take a look at the most obvious place we think of when it comes to the royals: Buckingham Palace. So many key events in the life of Elizabeth occurred within these walls, as with many monarchs before her, but who was there when the Register was taken? There are seven people in the household (six and a later addition), with the King and Queen so well-known they had no need to enter their full names, instead opting for 'His Majesty THE KING' and 'Her majesty THE QUEEN,' respectively. Typical entries always give full name with middle initials, as well as each person's full date of birth. Of those in the Royal Household, a final column on the second page gives details of anything considered militarily relevant – so we see soldiers, those in the blood transfusion scheme and ARP wardens. Although Queen Elizabeth has advised a great number of Prime Ministers, undoubtedly the most historically influential was Winston Churchill. In his post at the beginning of her reign, he also steered the nation through its greatest 20th century crisis. On the eve of the Second World War he was First Lord of the Admiralty, though somebody has later added the detail that he was "Prime Minister". Details were often later added, including changes of surname when someone later married. This makes the 1939 Register an unrivalled aid for finding more recent relations. Some records on the Register are closed. Queen Elizabeth herself cannot be shown, for example. This is because those who are still alive are protected for privacy reasons and appear as blacked out lines on the image. These records can be opened by giving details of the person's death and we open these regularly. 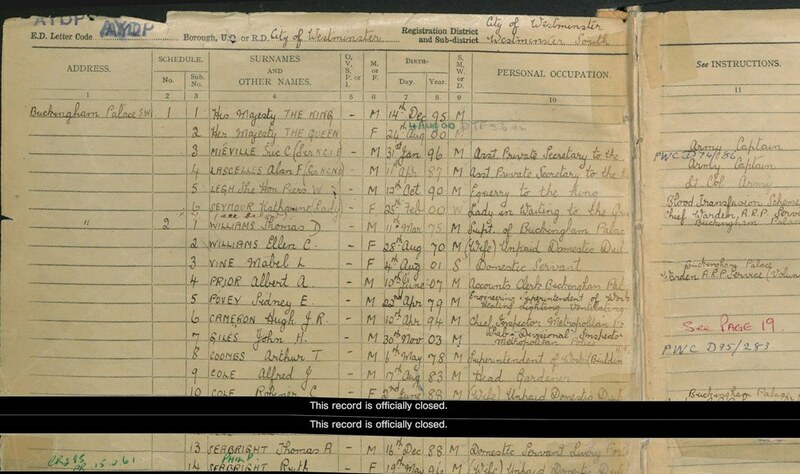 We know the Queen was at Balmoral when the Register was taken, but to preserve her privacy, as a living person her record is unavailable to view. And let's not forget the scores of men and woman who served in the Royal Household. From grooms to ladies in waiting, cooks to pageboys; all had a part to play. They may not be as recognisable as Queen Elizabeth or Prince Phillip but without them the Royals simply could not function. Findmypast has records of these servants from the 1500s to the 1920s, including many of those who were still serving in the period of Elizabeth's youth. If you're lucky enough to have built a family tree with some kind of connection to the house of Windsor, you can watch The Crown and enjoy the wonderful casting that brings your family history to life – but even if your blood doesn't run blue, don't forget we can still help you discover unparalleled detail about those ancestors and relations that worked alongside them. Either way The Crown is still a royally good way to spend your time! The Crown is © 2016 Left Bank Pictures (Television) Limited. All Rights Reserved.